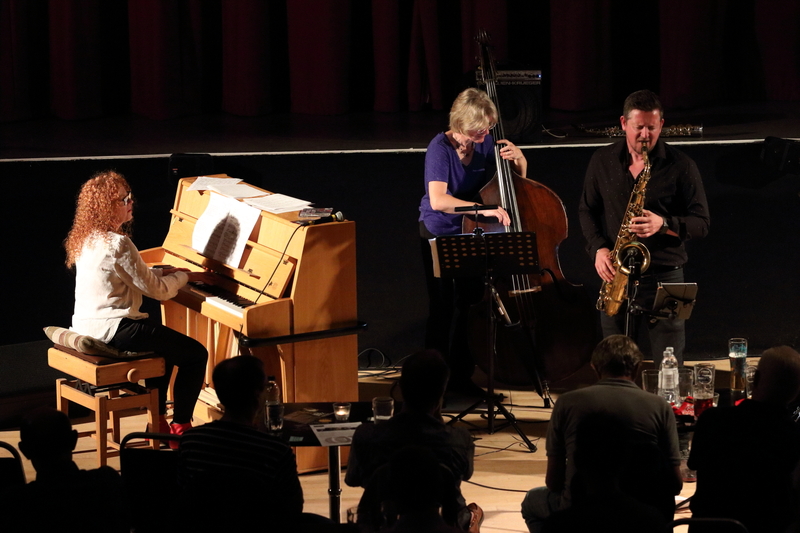 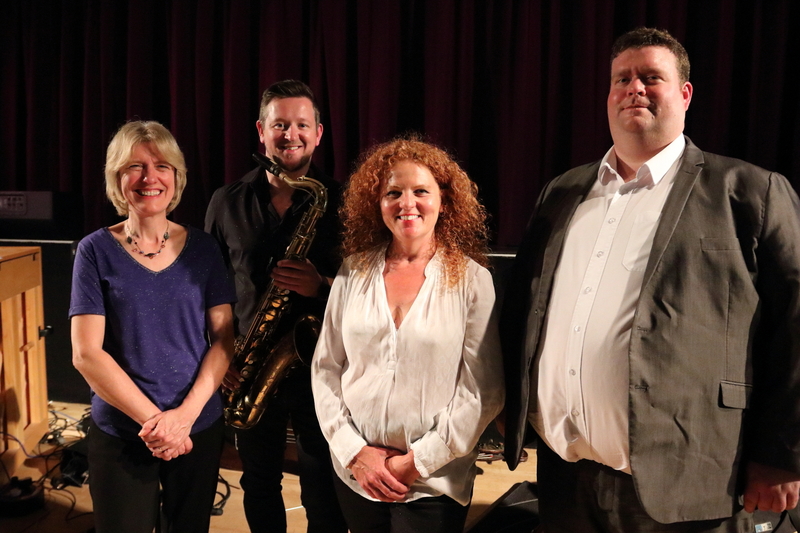 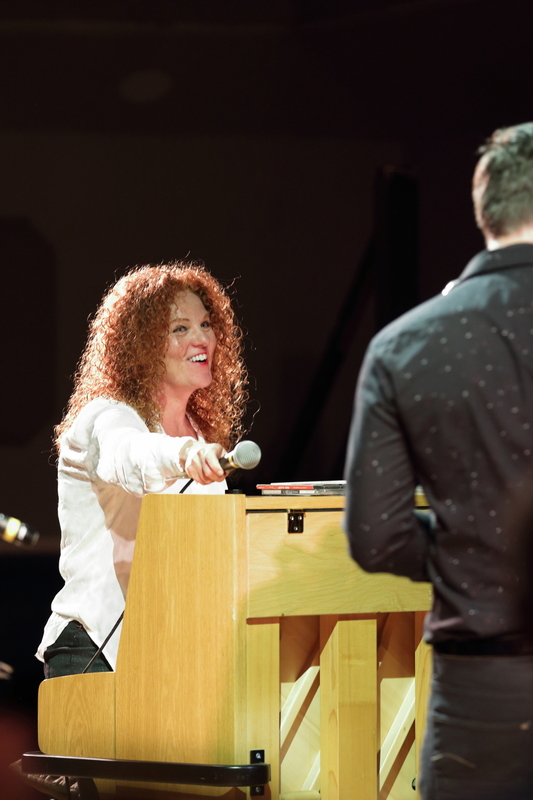 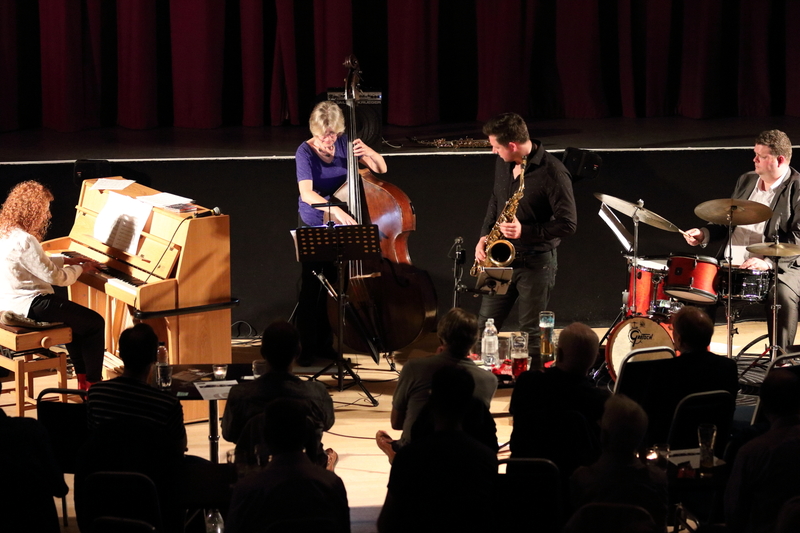 Paul Booth – tenor sax, Janette Mason – piano, Marianne Windham – bass, Nat Steele – drums. 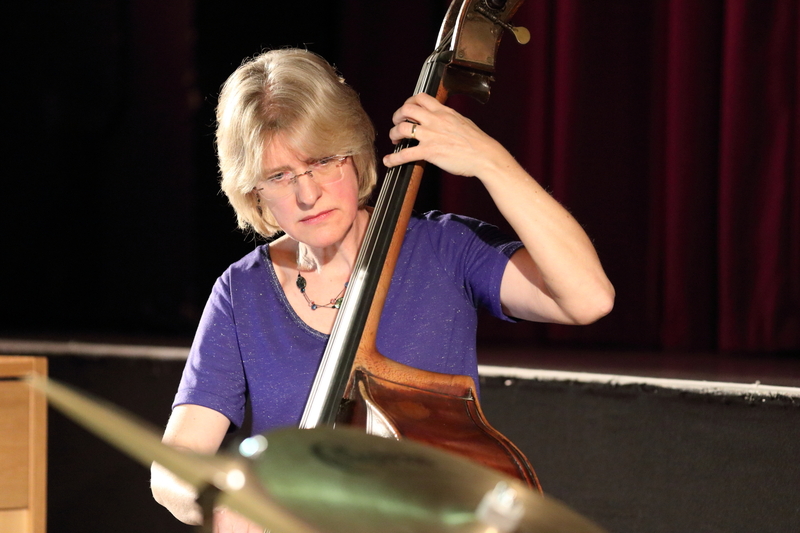 Photographs courtesy of Ana Peiro (Aldershot, Farnham & Fleet Camera Club). 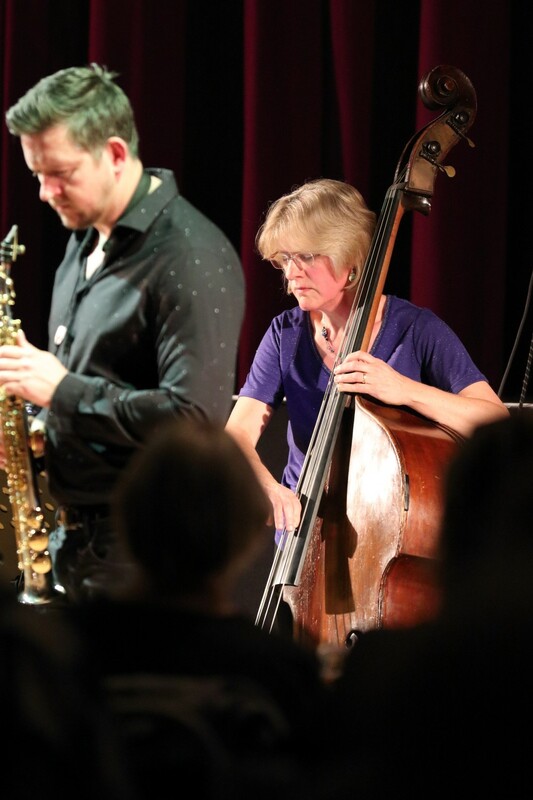 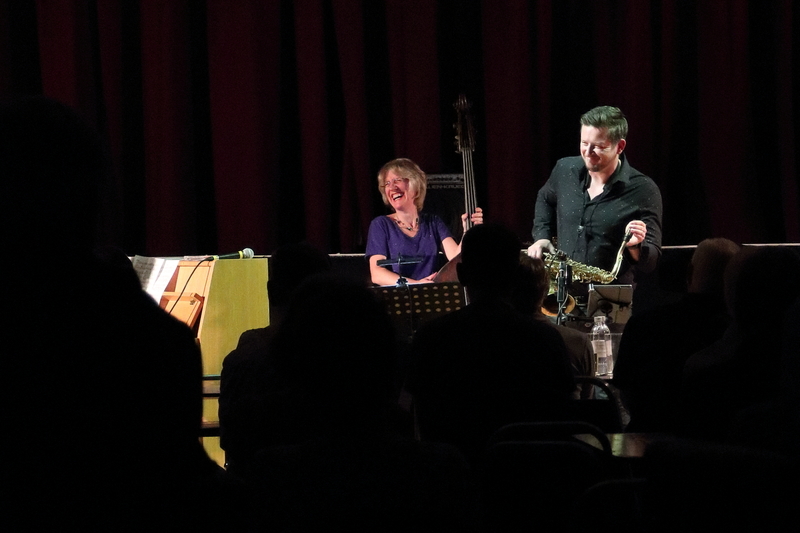 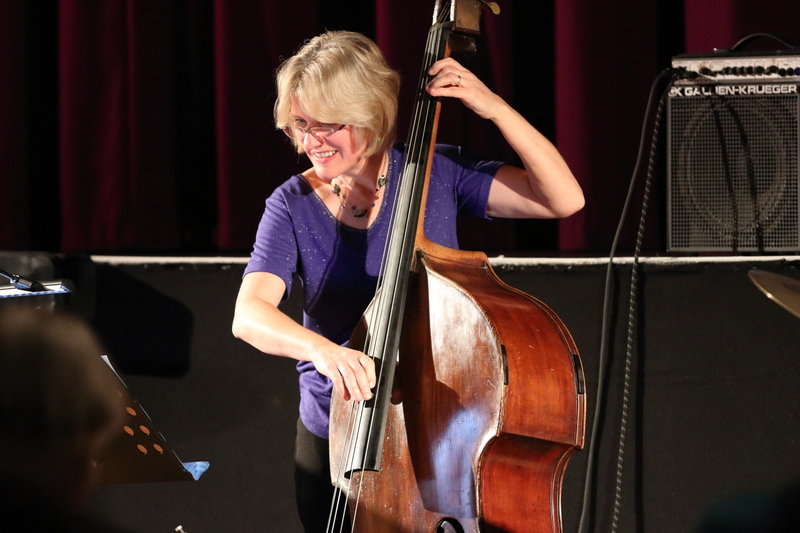 Marianne Windham performing in the Janette Mason Trio at Fleet Jazz Club on 15th May 2018. 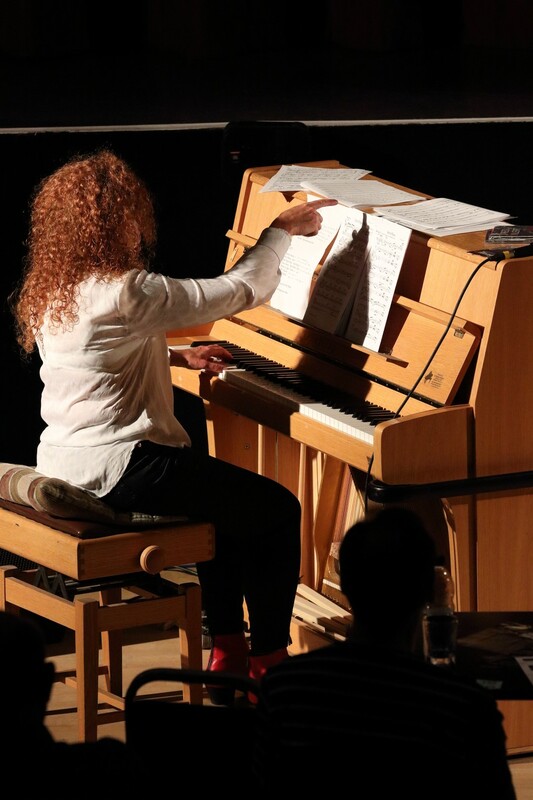 Photograph courtesy of Ana Peiro from the Aldershot, Farnham & Fleet Camera Club. 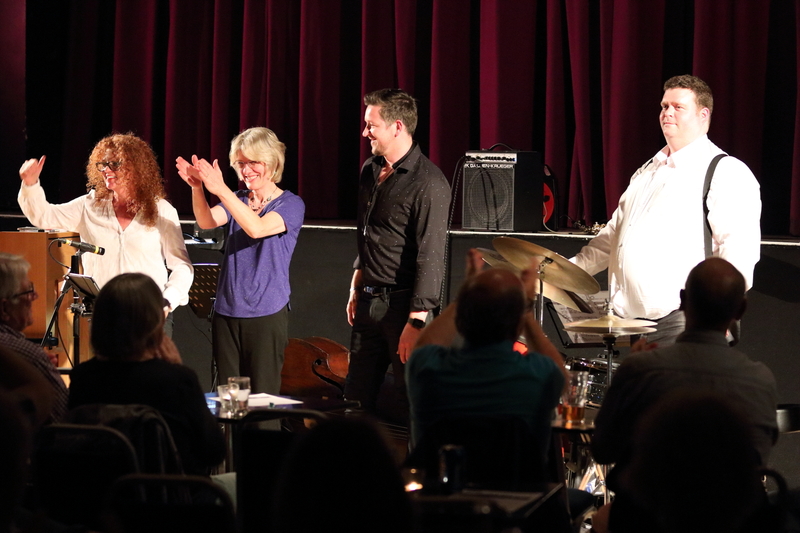 Janette Mason performing in the Janette Mason Trio at Fleet Jazz Club on 15th May 2018. 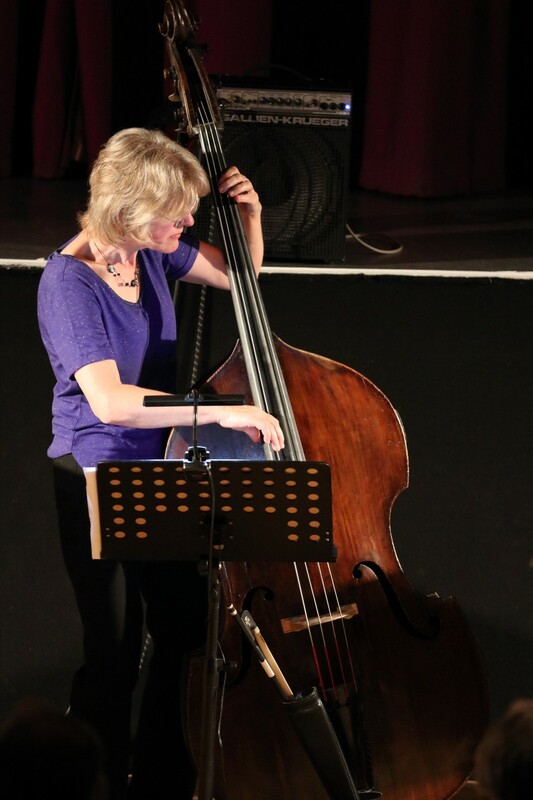 Photograph courtesy of Ana Peiro from the Aldershot, Farnham & Fleet Camera Club. 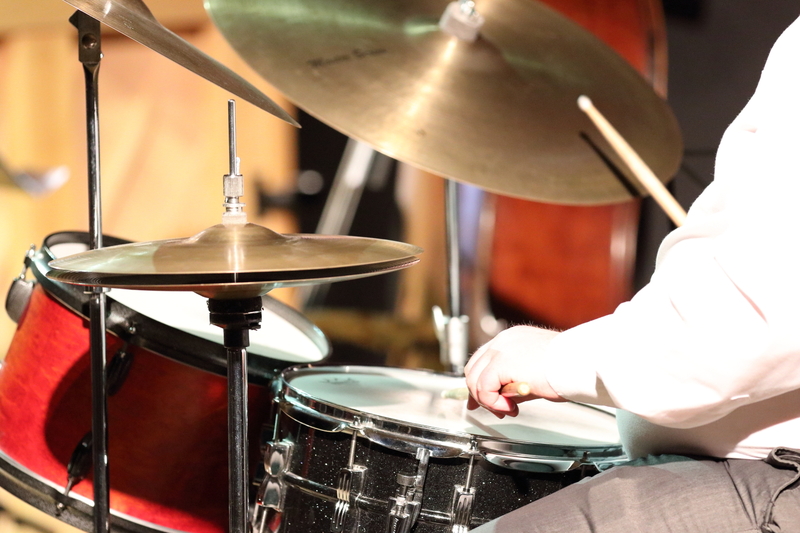 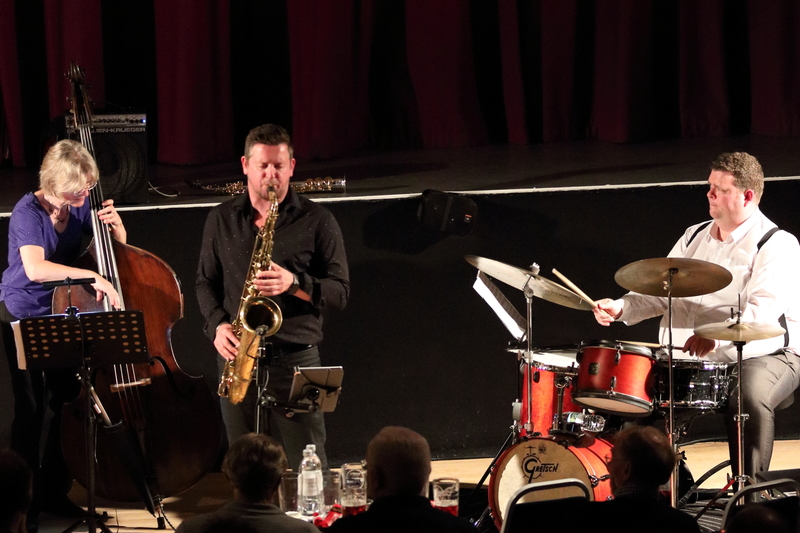 Paul Booth with the Janette Mason Trio performing at Fleet Jazz Club on 15th May 2018. 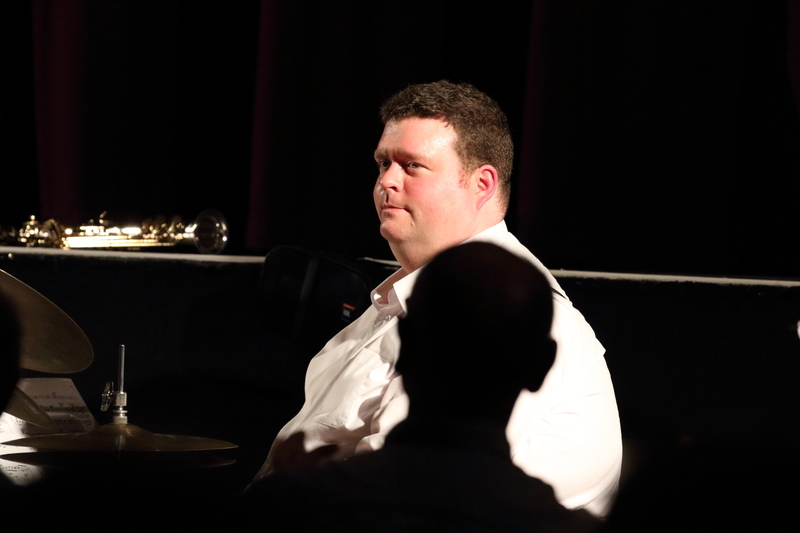 Photograph courtesy of Ana Peiro from the Aldershot, Farnham & Fleet Camera Club. 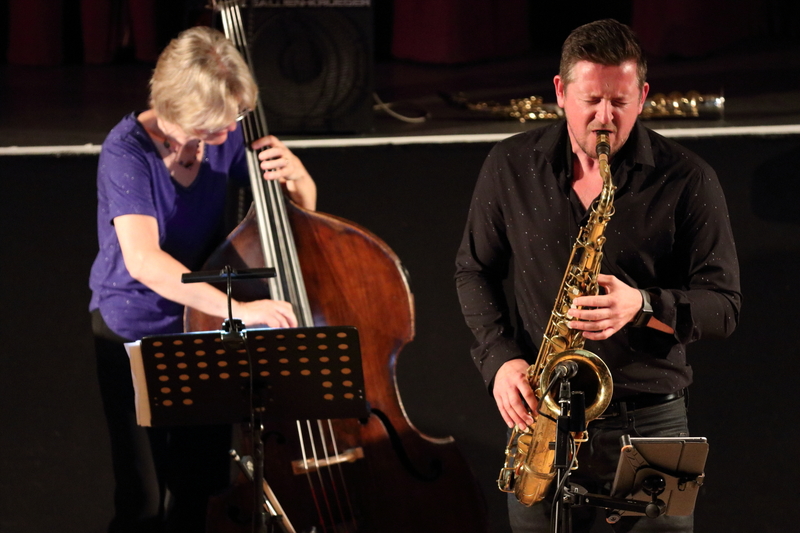 Paul Booth and Marianne Windham performing at Fleet Jazz Club on 15th May 2018. 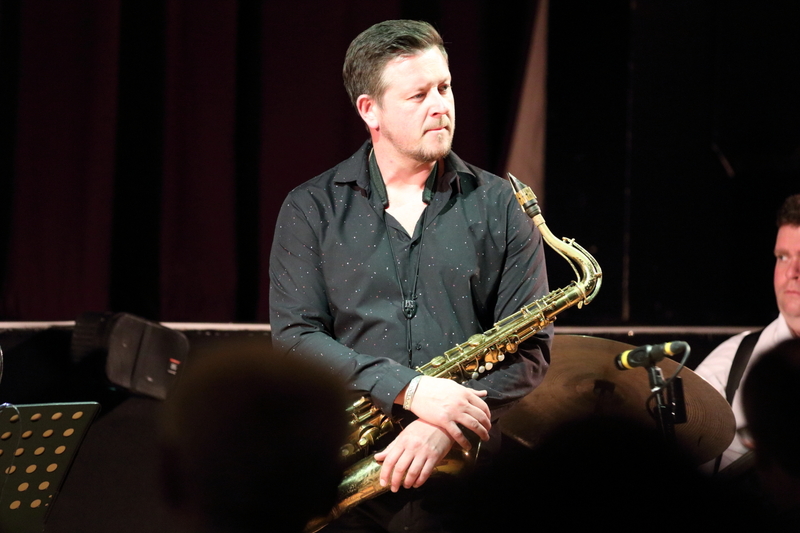 Photograph courtesy of Ana Peiro from the Aldershot, Farnham & Fleet Camera Club. 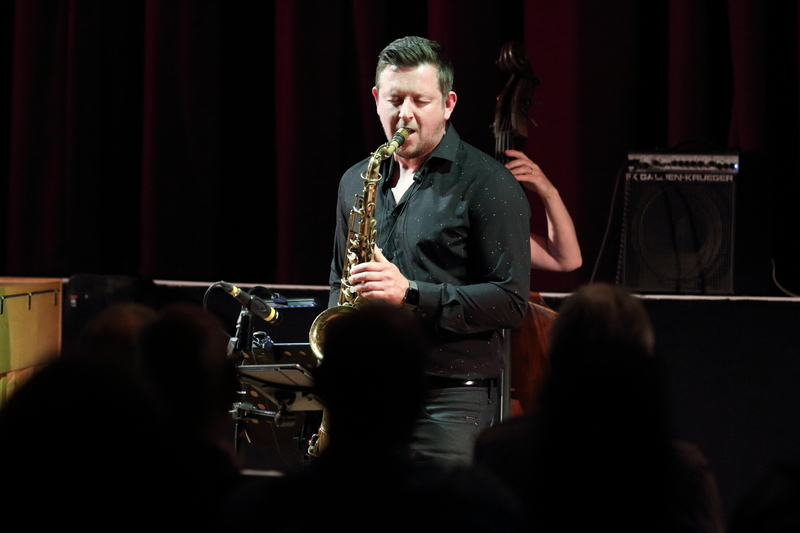 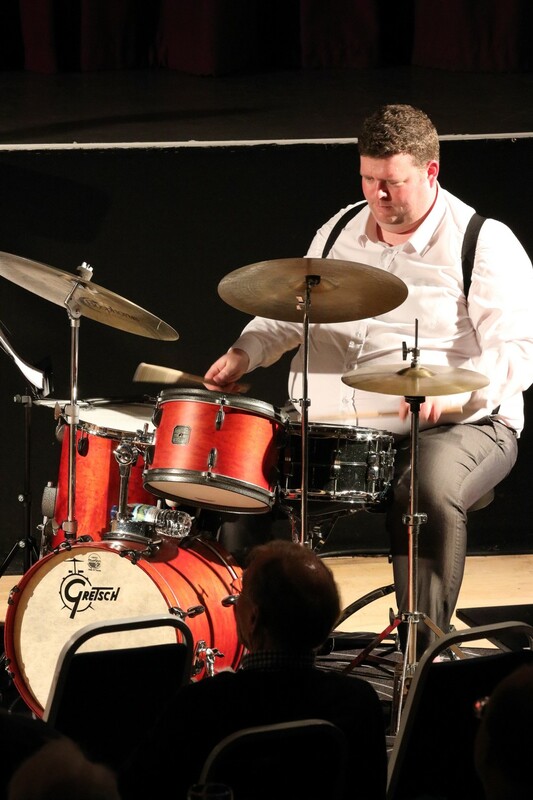 Nat Steele performing in the Janette Mason Trio at Fleet Jazz Club on 15th May 2018. 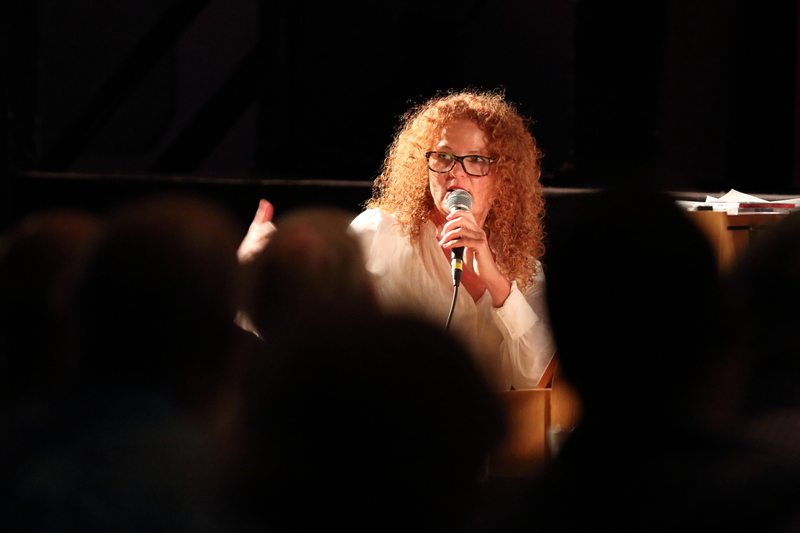 Photograph courtesy of Ana Peiro from the Aldershot, Farnham & Fleet Camera Club. 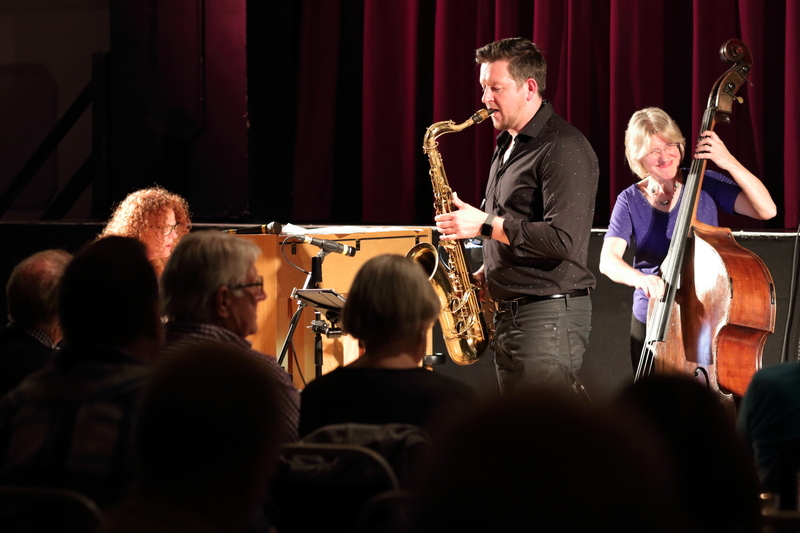 Paul Booth performing with the Janette Mason Trio at Fleet Jazz Club on 15th May 2018. 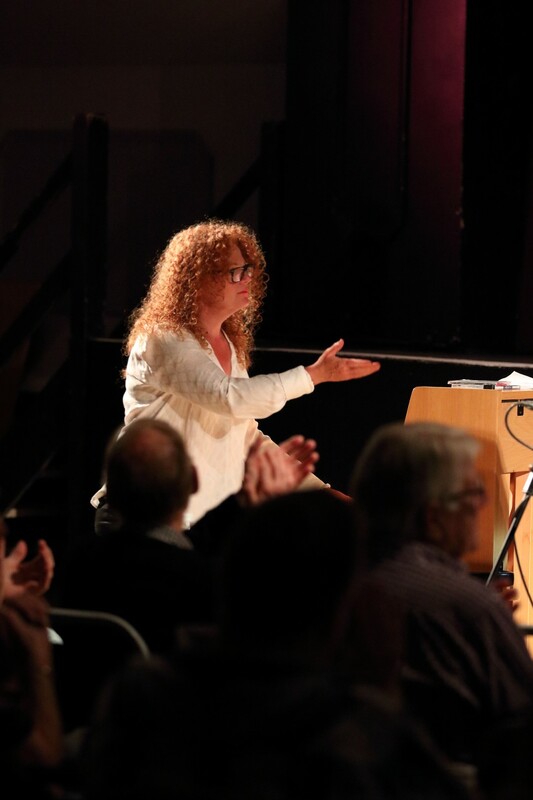 Photograph courtesy of Ana Peiro from the Aldershot, Farnham & Fleet Camera Club. 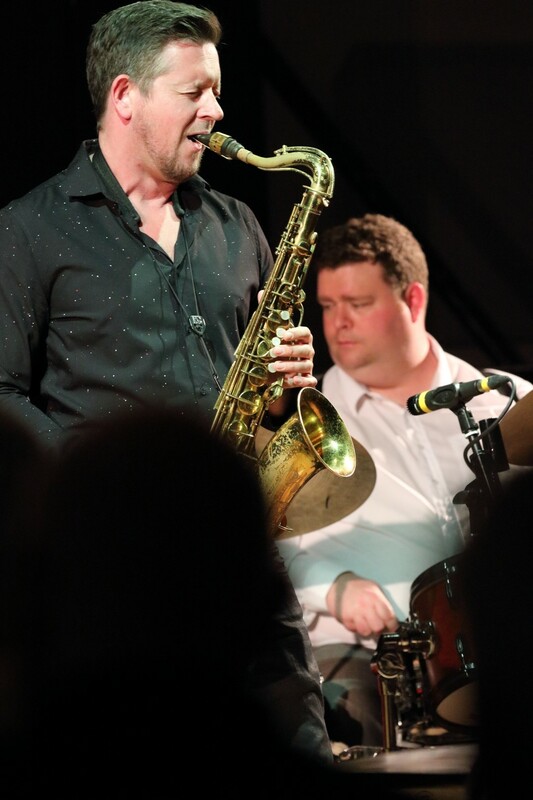 Paul Booth and Nat Steele performing at Fleet Jazz Club on 15th May 2018. 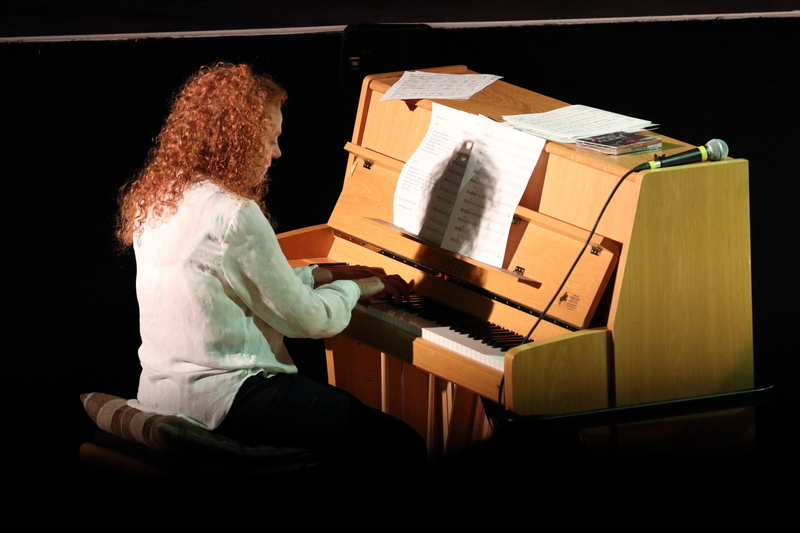 Photograph courtesy of Ana Peiro from the Aldershot, Farnham & Fleet Camera Club. 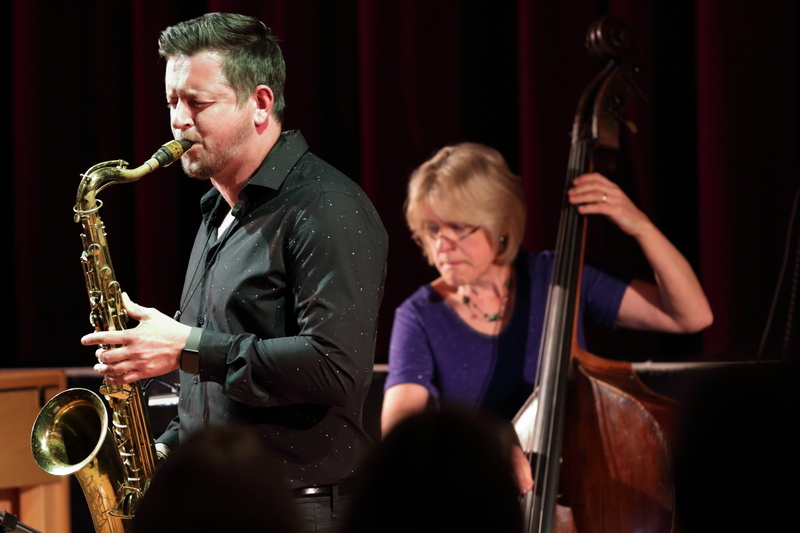 Top billing acclaimed saxophonist Paul Booth joined the trio of pianist Janette Mason to pay tribute to the music of jazz legends Horace Silver and Herbie Hancock. 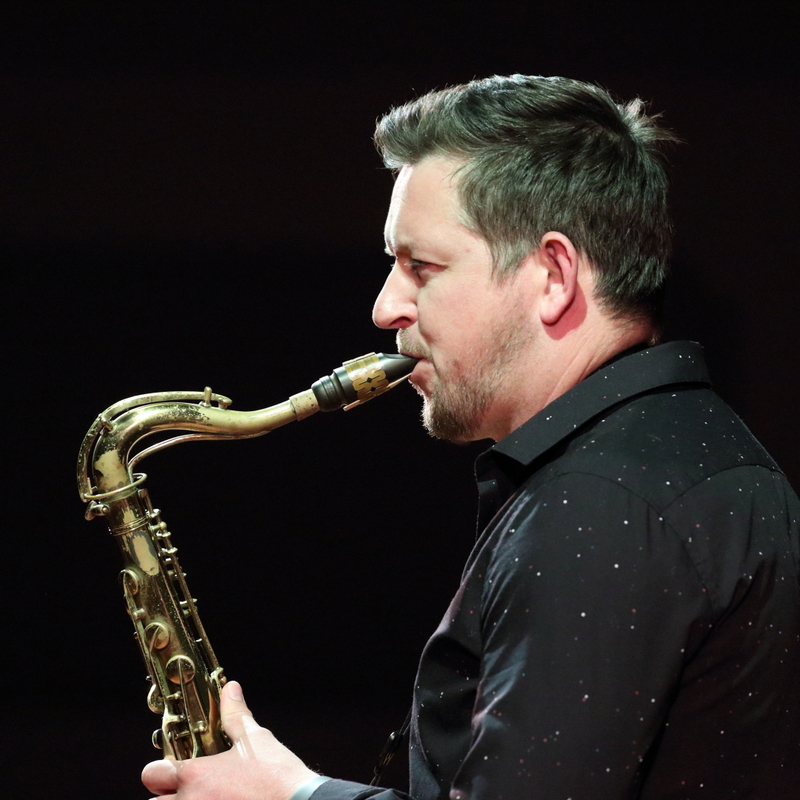 Tenor saxophonist Paul Booth is an in demand solo artist, as well as a ‘first call’ sideman for many big names in both jazz and popular music worlds. 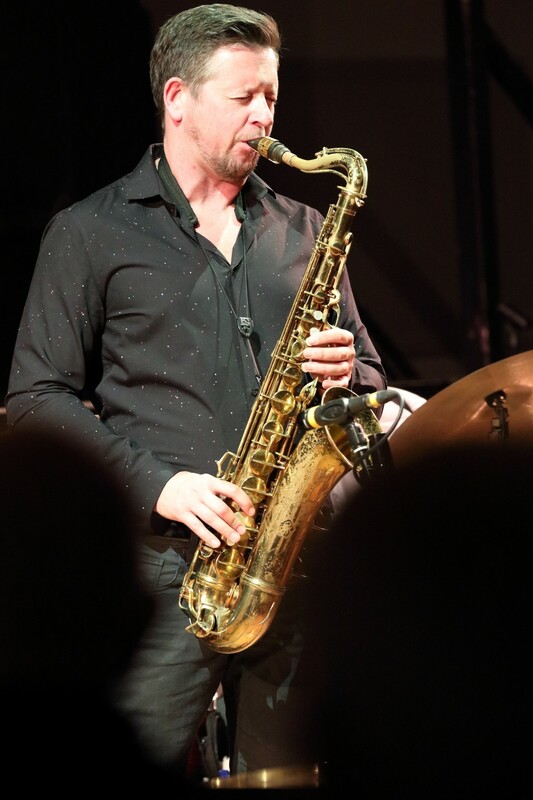 He has worked worldwide with a variety of well-known artists including Steve Winwood, Steely Dan, the BBC Big Band, Carlos Santana, Eric Clapton, Riverdance, Ingrid Jensen, Matt Bianco, Eddie Henderson, and many more. 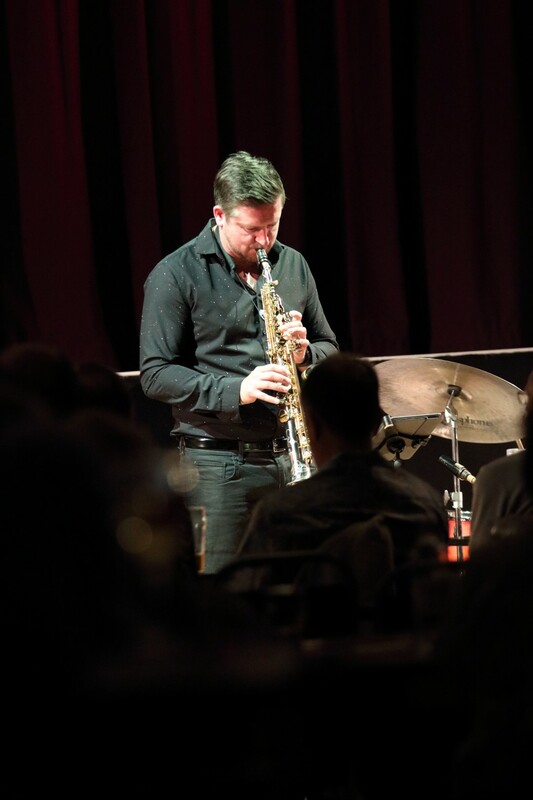 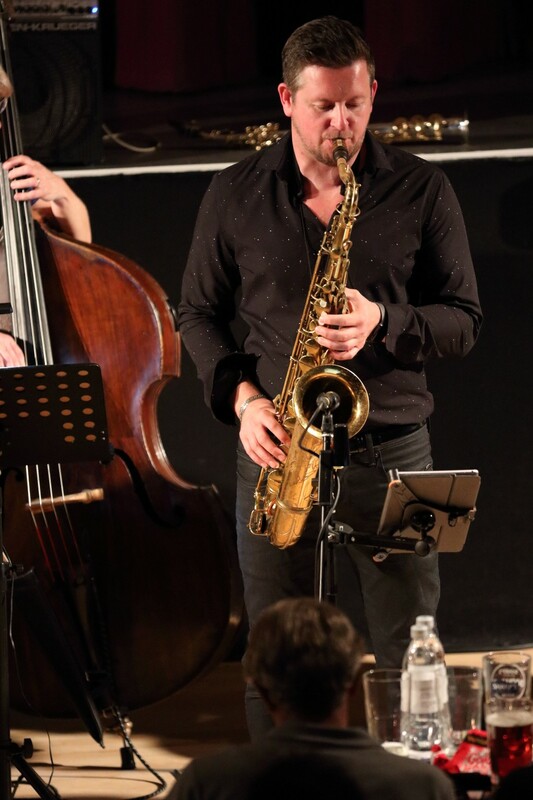 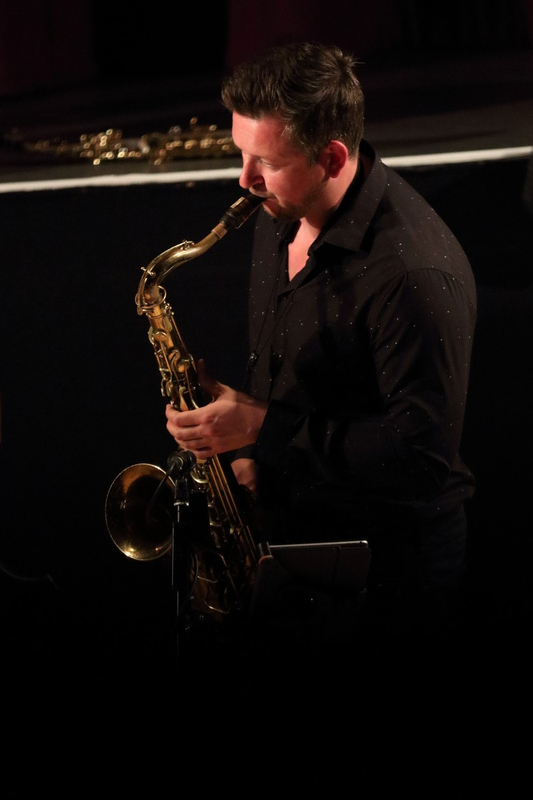 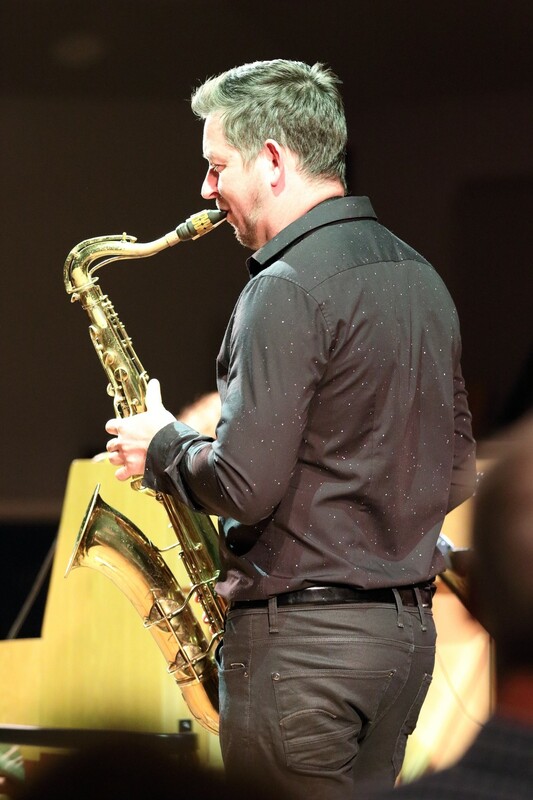 Whilst studying at the Royal Academy of Music, he won several awards including the prestigious Clifford Brown/Stan Getz fellowship held in Miami, and the Best Modern Jazz Player category in the UK televised “Young Jazz Player of the Year” competition. 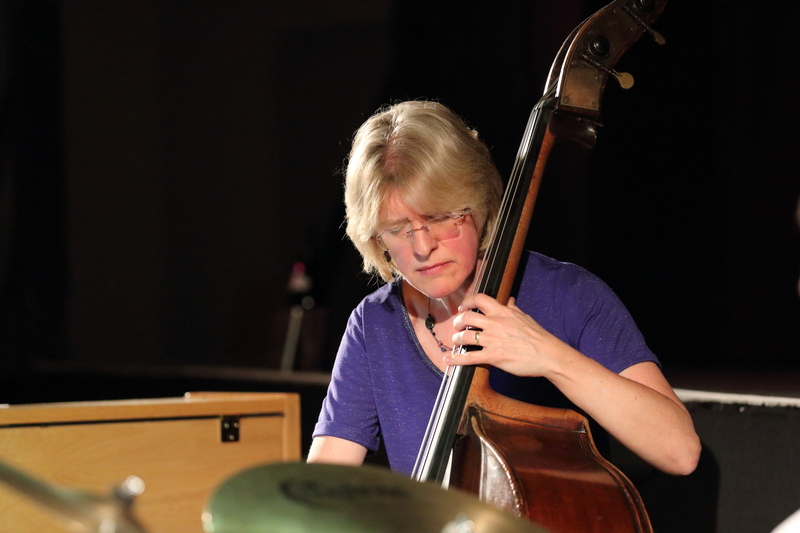 A mainstay of the British Jazz scene for over a decade she has toured her unique sound worldwide, playing everywhere from The Atlanta and Rochester Jazz Festivals to the Carnegie and Albert Hall. 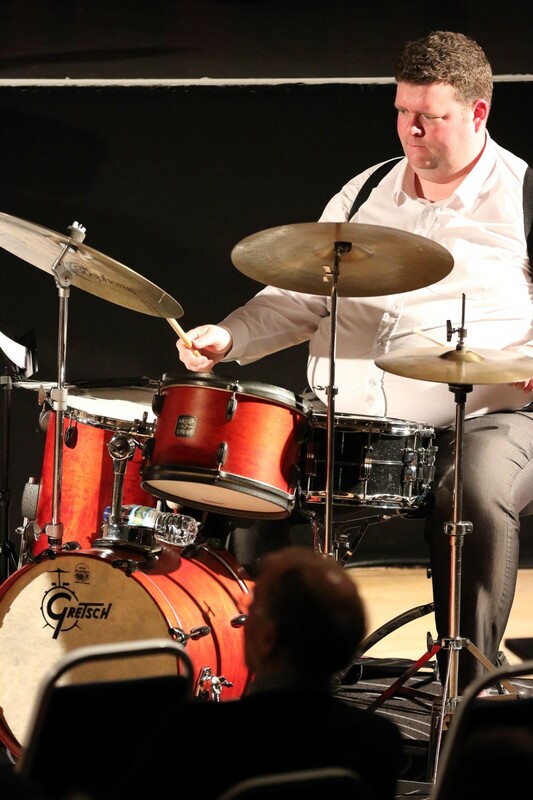 Nat Steele is a drummer and vibes player and has performed with most of the names on the London jazz scene, including on the opening gig of the London Jazz Festival with Pete King and Henry Armburg Jennings; Christian Brewer, Atila, Bobby Wellins, Steve Kaldestad, Nigel Price, Marie Murphy, Steve Fishwick, Alex Garnett, Matt Wates, Mike Gorman, Gareth Lockrane, Dave Cliff, Simon Woolf, John Pearce, Dave Newton, Gabriel Latchin, Josh Morrison, Tim Lapthorn, Clark Tracey, Matt Ridley, Sammy Mayne, Martin Hathaway, Ross Stanley, Mark Crooks, Olly Wilby, Geoff Gascoyne, Colin Oxley, Roger Beaujolais, Simon Thorpe, Richard Busceiwicz, Steve Brown, Matt Home, Leon Greening, Graham Harvey, Dave Warren, Alec Dankworth, Matt Skelton, Allison Neale, Gary Kavanagh, Dave Chamberlain, Julian Bury, and with visiting American artists Hod O’Brien, Greg Abate and Joyce Breach.